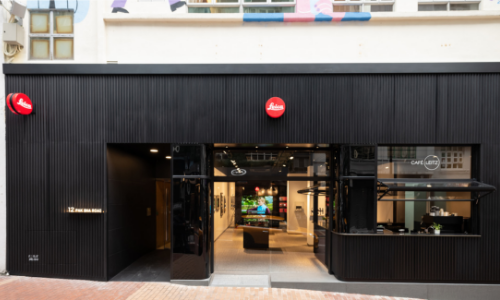 Leica Camera has opened its first Hong Kong flagship store in Causeway Bay, bringing cameras, lifestyle products, and artwork to the city. Apart from selling Leica cameras, accessories, and photography publications, the flagship store with movable shelves also serves as a flexible venue for seminars and workshops, leading customers into the greater world of Leica. In addition, a grand VIP suite taking visual references from shutter speed values will allow the prestigious guests to share and enrich their stories with Leica while savouring a coffee. Located at Pak Sha Road, the Leica Store Hong Kong Causeway Bay set up an interactive community in Wan Chai jointly with f11 Photographic Museum, f22 foto space and the Hong Kong Customer Service Centre, offering the brand’s followers and photography enthusiasts with the latest news and information. Leica also launched a travel guide to introduce the four locations related to the brand and has invited photographers and collectors to share their favourite photo-taking spots. From 18 February to 31 March, Leica will further celebrate the opening of the new flagship store with “The Tasteful Journey of Leica” campaign, where participants can get a free copy of the travel guide at the Hong Kong customer service centre, f22 foto space, f11 Photographic Museum and the Causeway Bay store. After collecting the stamps at the four spots, participants can redeem a complimentary gift at the new flagship store. A specially-designed Hong Kong tram ticket is also included in the travel guide to encourage the readers to experience the signature heritage of Leica use on this iconic piece of transport. Cherrypicks’ mobile solutions business has been bought by game developer NetDragon for HK$236.5 million, while Cherrypicks Alpha r..